Rabbiting Spade or "Poacher's Spade"
Thanks for visiting us online, where we can help you in whatever state you are in (or country, for that matter). We are the only blacksmiths in the United States specializing in hand forged garden tools for home gardeners, nurserymen, landscapers, and farmers. 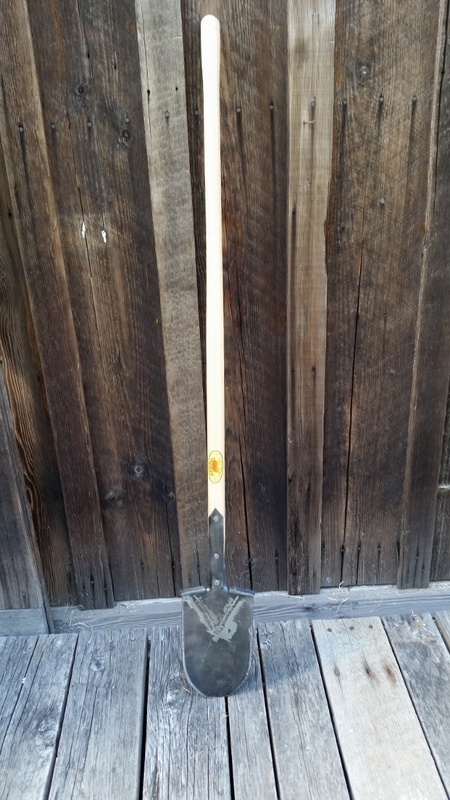 We've been producing hand-forged implements and selling garden tools since 1989. 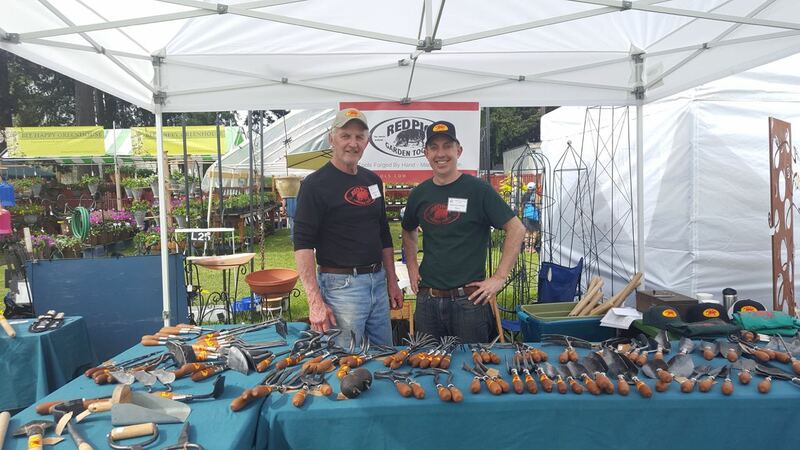 Seth Pauley, current owner of Red Pig Garden Tools, learned blacksmithing, tool-making, and the history and use of garden tools under founder Bob Denman's guidance and mentorship. Bob is a tool designer, inventor, and frequent writer on various gardening topics. Bob continues to mentor Seth, and their friendship and collaboration has grown steadily over the last few years. In the fall of 2017, Seth tool over production of all Red Pig tools, the online store, the brand, and day-to-day business operations. He supplies tools to Bob for the retail store, still run by Bob and Rita on their property. Bob and Rita are your contacts in the retail store. Having started off in California in the late 1980s, and relocated to Oregon in 2004, Bob and Rita have years of retail and gardening experience. Seth spent summers in Portland with his father, sisters, and step-mother beginning in the mid-1980s and brought his wife and young daughters back to the Portland area in 2016 after several nomadic years in Canada, back east and in the midwest. The retail store offers a one of a kind experience to those living or visiting the Portland area. It is housed in a two story barn that Bob built out of the lumber from two 100-year old Oregon barns. The store is fantastic — in the summer it's cool and bright, and in the winter you can warm your feet at the pot belly stove. The retail store has a little of everything, together composing over 1000 different items, including at least 20 different patterns of hoes; steel rakes ranging from 6 tines to 24 tines; one to five-tine cultivators; ball weeders; hand plows; rock picking forks, root hooks; cradle forks for overhead pitching; mangel cutters; weed spuds; wood tine rakes; hot bed weeders and hundreds of other unique or rare implements. We also offer sharpening of non-power pruning and other edged tools, re-handling, restoration, repair and custom tool making. Over the next couple of years, expect to see an expanding range of Red Pig tools made available online, including variations of our tools in longer handles, some smaller tools, sets of tools commonly bought together, and special purpose tools that combine Bob and Seth's ingenuity and interests. We'll also expand the educational and informational content on our website to try to share the expertise that visitors to the store or to one of Bob's talks will often get. Seth is craftsperson, writer, and student of history as well as a blacksmith, traveler, and dedicated father to two young daughters and husband to an art conservator. 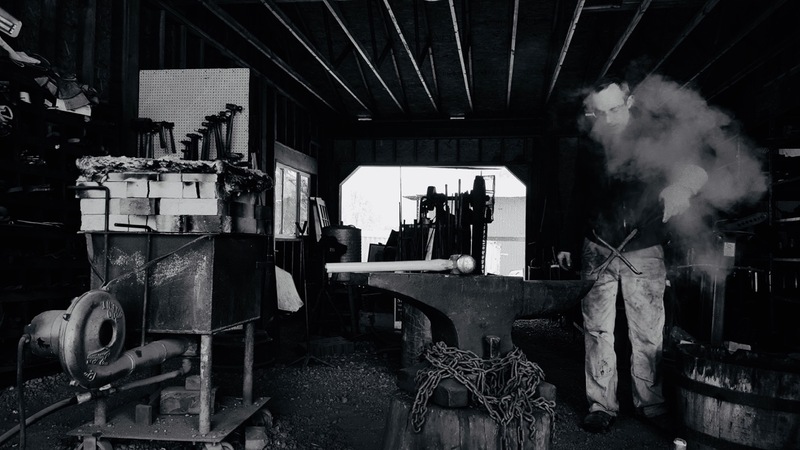 With a life-long devotion to the creative arts - from creative writing to ceramics to wood-working and now blacksmithing - Seth's interest in history and in learning obscure crafts from artisan practitioners has led him to seek out and find mentors. Those mentors have guided his practice of acquiring skills that often can be learned but not directly taught. From working with renowned ceramics artist Mahmoud Baghaeian in Montreal to other less renowned but highly skilled artisans in areas such as woodworking and spot finishing to learning blacksmithing from Bob, Seth has had the privilege of learning artistry through hands-on experience and direct contact with his mentors. In addition to his creative pursuits, Seth followed an unconventional career path. He has founded or co-founded four other small businesses; taught creative writing and literature at Temple University in Philadelphia; co-founded a literary journal and reading series; written and edited for various arts and culture related publications; served on multiple school boards and committees, and spent many years helping small, family-owned American manufacturers of high quality products create remarkable online experiences for their customers. Bob is a frequent speaker at garden club events, Master Gardeners Classes and conventions on various gardening topics. If you're interested in having Bob talk at one of your club meetings, just call or email and we'll send you some information. Bob has been a contributor to Fine Gardening and Horticulture magazines. His articles have also appeared in SmallFarm Today and has a regular column in New Pioneer Magazine, called "Blacksmith Bob." Bob is also an inventor and has invented several items, including: garden pants with built-in knee pads; forged, solid socket trench clean out shovels with flat bottoms and turned-up sides; a combination diamond file, screw driver and multi-wrench for tool maintenance; pruning tool maintenance oil; an improved ball weeder; a heavy duty watering wand; a line of hand tools with screw-on handles; a root saw; a potting trowel and a blackberry hoe. Formerly, Bob was a product development consultant to Corona Clipper Company, America’s leading manufacturer of professional pruning tools. He provided specifications, conceptual designs, field-testing and evaluation for Corona’s new generation of hand shears, loppers and hedge shears. He played a critical role in developing Corona’s complete range of garden, landscape, agricultural and construction hand tools when the company expanded its offerings in the early 2000’s. Bob and Rita have been the subject of many magazines such as Horticulture, Sunset, Garden Design, and the Los Angeles Times Magazine. In 2016, Bob was featured on Handcrafted America, a tv program about America's artisans and their skills. In 2005 they were the subjects of a segment on PAX television’sPeople Places and Plants program. Bob also appears occasionally on Saturday morning's Garden Time TV in Portland, OR. Prior to founding Red Pig Garden Tools™ (formerly Denman and Company) in 1989, Bob and Rita operated an advertising and graphic design studio. A former journalist, college football linebacker and motocross rider, Bob now confines his physical activities to the smithy and the garden, feeling that there is danger and excitement enough at home.